What is another word for aptly? 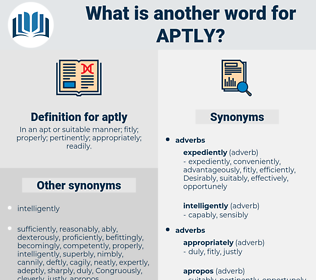 In an apt or suitable manner; fitly; properly; pertinently; appropriately; readily. 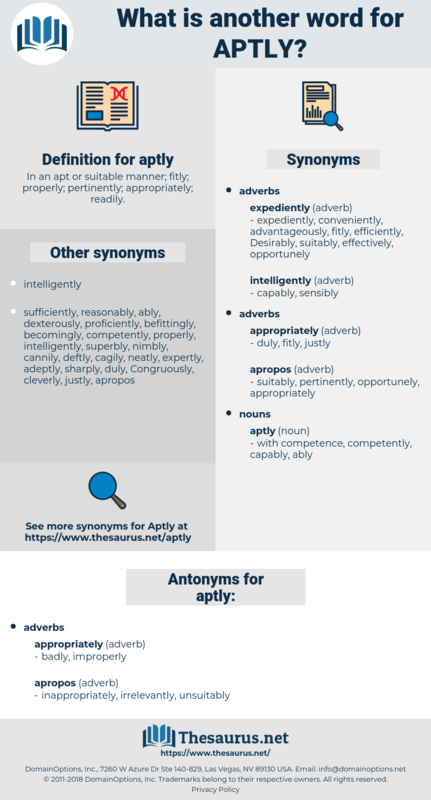 appropriately, rightly, correctly, accurately, properly, eloquently, adequately, judiciously, suitably, rightfully, exactly, wisely, justifiably, precisely, conveniently, justly, duly, amply, successfully, well, usefully, sensibly, advisedly, perfectly, effectively, specifically, narrowly, ably, sufficiently, fairly, understandably. inaccurately, unfairly, unjustly, indirectly, incorrectly. This and what one of our ablest generals aptly described as the " affected sympathy" of the men in office, high or low, for the men in the workshop, - the more affected the louder, - brought about and will bring about again these scenes of tumult, riot, and rage that, but for the restraining hand of the regular army, would result in anarchy. One remark he overheard, which stood aptly for the attitude of all.